I love a good salad and I love snacking on crunchy vegetables. I’ve been eating a lot of broccoli and cauliflower lately and I wanted to take it in a little different direction flavor wise. I also wanted to create something that would work with the Raw Vegan journey I’m trying to transition to. This recipe works if you are eating Clean, going Paleo, going Vegan or even low carb. This salad is full of delicious, nutritious veggies and lots of spicy curry. 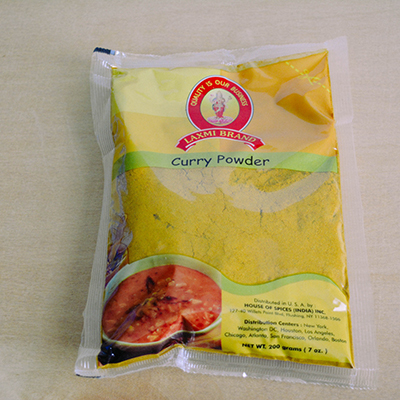 The curry I use is made up of coriander, red chillies, tumeric, cumin, pepper and fenugreek. Yum! This recipe is also great for meal prep. 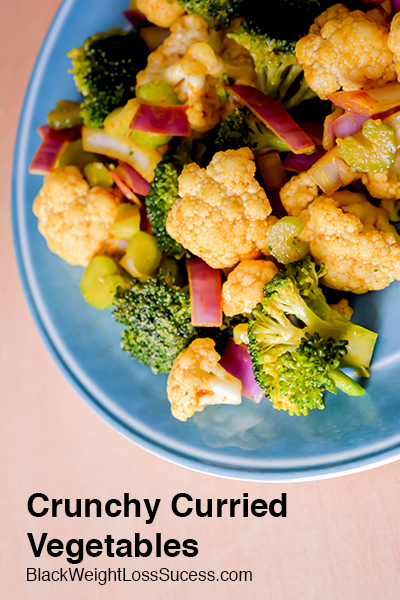 It makes an awesome side dish when paired with fish or chicken. I find that when I make it and let it sit overnight, the flavors get to sink into the veggies more and it’s totally wonderful. I usually eat it over the course of 3 days… depending on how much my husband eats. Bonus: If you aren’t in the mood for a salad, you can heat it up. Roast in a baking dish at 375 for about 30-35 min. We are talking tasty, ok? Spicy and Crunchy collide in this delicious and satisfying salad. Curry at its best. 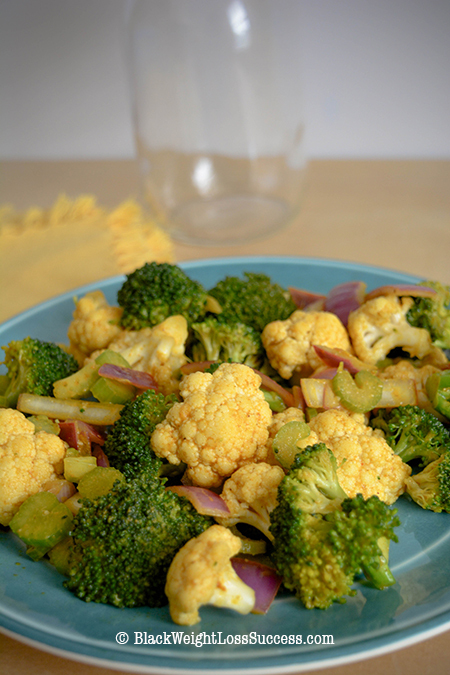 For this recipe, you need broccoli and cauliflower florets. Measure out the cups liberally. Chop your red onion into large dice or cut it into ½ inch wide strips, and then cut those strips in half. Slice your celery into ¼ inch moons or ⅛ inch moons (your choice). 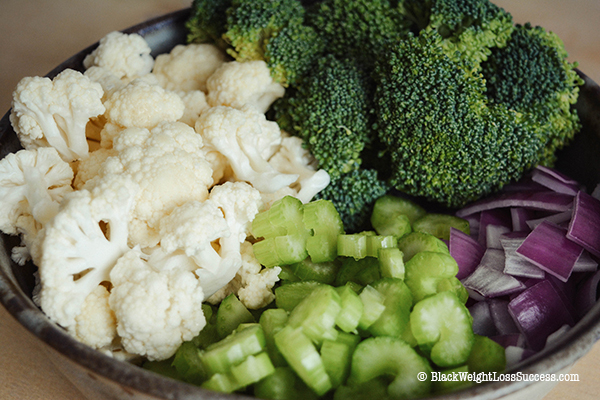 Combine all of the veggies into a large bowl and set aside. Combine the lemon juice, olive oil and apple cider vinegar into a small bowl and stir to create a dressing. Pour the dressing all over the vegetables in the large bowl and mix to coat. In another small bowl, mix the salt, pepper and curry powder together. 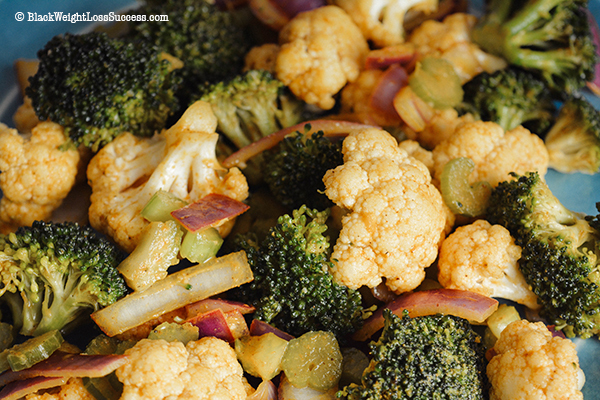 Use a spoon to sprinkle the seasoning mixture all over the veggies. Sprinkle in one spoonful at a time and mix the veggies after each spoonful. PS: If you don’t like onions, you can use carrots instead. Carrots or grape tomatoes will help to mellow out the onions.